Cindy Egger has been performing professionally since she was in her teens. Originally from Cedar Rapids, IA, she moved to Kansas City in 1987 to study under the tutelage of Douglas Niedt. 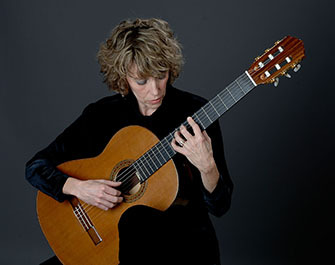 She received a Master of Music degree in Classical Guitar Performance at the University of Missouri-Kansas City Conservatory of Music and was given the Outstanding Student Award at the Master's level. Cindy loves many styles of music, and that is reflected in her various performances. She plays classical and electric guitar, banjo, electric bass, ukulele, and even drums once in a while. She has performed with the Kansas City Symphony (Celebration at the Station, Brian Stokes Mitchell, Bernadette Peters, Audra McDonald, Kristen Chenowith, The Texas Tenors, Matthew Morrison). She was the guitarist for the world premiere of Between the Lines at the KCRep. She has played in many musicals at Starlight Theatre (Motown the Musical, Something Rotten, Matilda the Musical, If/Then, The Sound of Music, Monty Python's Spamalot, Footloose, The Addams Family, Aida). Cindy got to play with the national touring show Chicago when it came to Kansas City (Kansas City Broadway Series). She has done weddings, funerals and private parties. Cindy has also gotten the opportunity to play A New World: Intimate Music From FINAL FANTASY at both the 2016 and 2017 Naka-Kon conventions in Overland Park, KS. Besides her various performances, Cindy teaches private guitar lessons at Guitar Dock in Lenexa. She has taught at Rockhurst University since 1994. In addition to all of this, she has been the guitarist/music director at Saint Andrew Christian Church since 1991. Cindy has recorded two solo CDs, "Finger Pickin' Good" and "Heart Strings". She can also be found playing on the CD "Intimate Dances" (Centaur Label), a compilation of works by composer Jerry Owen. A bit of her life is captured in a book about local Kansas City women, "A Power of Her Own," by Kathryn Sommer. Her most recent recording is with Joy Zimmerman on Joy's CD, "True North."